Vancouver, Canada / TheNewswire / December 4, 2018 - Radius Gold Inc. (TSX-V: RDU) is pleased to announce results from the Company's initial drill program at the Amalia Gold-Silver Project in Chihuahua, Mexico. Five drill holes tested the Campamento - San Pedro structural corridor, intercepting gold mineralization in all holes with the deepest hole cutting 26m at 7.08g/t Au and 517 g/t Ag. The nine hole 1909m diamond drill program was completed by Radius and funded by Pan American Silver under a joint venture agreement (see Radius news release August 27, 2018). Three target zones (Campamento/San Pedro, Guadalupe and Dulces) were tested across a strike length of 1.8km following the trace of a large regional fault and associated splays hosting high level epithermal gold and silver mineralization. 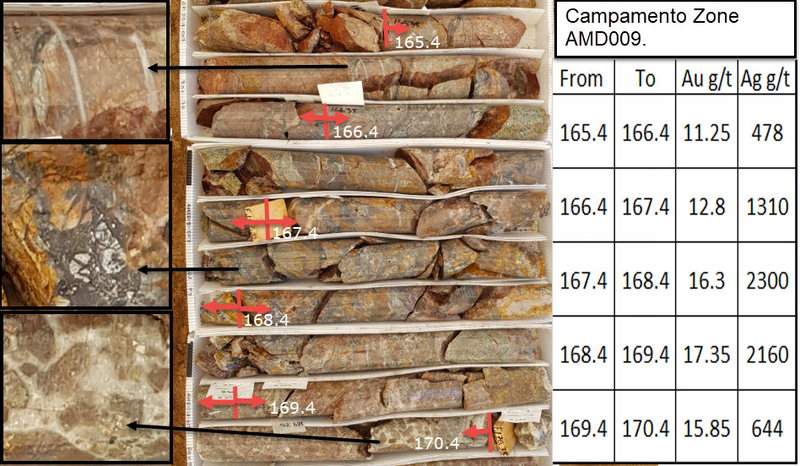 Five drill holes (AMD001 / 003 / 007 / 008 / 009) were drilled between the Campamento and San Pedro targets (Campamento Zone) defining a 650m strike length of epithermal banded veining, stockworks and multiphase breccia with significant gold and silver mineralization. A table of results is listed below. This initial drill program was designed to test the targets between 50 and 150m below ground surface. Considering the topography the drill holes cut mineralization in a range between 1988 m above sea level (asl) and 1882m asl, effectively testing the mineralization over a 100m vertical interval. AMD001 cut the zone highest in the system at 1988m asl and was still within the upper rhyolite host. AMD009 cut the system within the andesite host at the deepest level (1908m als) and recorded the best widths (26m) and highest grades with bonanza intervals, including 5m at 14.71 g/t Au and 1378 g/t Ag. * elevations are given as metres above sea level at the top of the reported interval. Drill holes were drilled perpendicular to the mineralized zone and reported intervals are thought to approximate true width. Mineralization at the Campamento Zone is open in all directions. On strike from Campamento, along the Amalia regional fault system, high grade gold and silver mineralization outcrops at intervals vertically at least 600m below Campamento. Similar style major epithermal mines of the Sierra Madre (e.g. Palmerejo, Pinos Altos, La Cienga) located in the same regional volcanic belt as Amalia are known to have mineralization occurring over large vertical intervals between 600 and 750m. To date the Radius / Pan American JV has tested a very limited part of the system and it is intended to follow the high grade mineralization along strike and to depth with further drilling early in the new year. Drill holes AMD002 / 004 / 005 / 006 targeted mineralization at the Guadalupe and Dulces zones. These drill holes did not intercept significant gold/silver mineralization. Figure 1: Photographic record of the high-grade zone in AMD009 with meter by meter assay. Bruce Smith, M.Sc. (Geology), a member of the Australian Institute of Geoscientists, is Radius's Qualified Person as defined by National Instrument 43-101 - Standards of Disclosure for Mineral Projects. Mr. Smith participated in the reported drill program and prepared and approved the technical information contained in this news release. Drilling is carried out using NQ and HQ size tooling. Drill core is cut in half using a rock saw with one half of the core then taken as a sample for analysis. Sample intervals are generally between 1m and 1.5m producing samples of between 2 to 9 kg. Half-core samples are delivered to the ALS Geochemistry laboratory facilities in Chihuahua, Mexico. The samples are fire assayed for Au and are analysed for Ag and multi-elements using method code ME-ICP61 following a four-acid digestion. Overlimits are analysed using an appropriate method. Radius routinely inserts multi-element geochemical standards and blanks into the drill core sample stream to monitor laboratory performance. Quality control samples submitted to ALS were returned within acceptable limits. Radius has a portfolio of projects located primarily in the United States and Mexico which it continues to advance, utilizing partnerships where appropriate in order to retain the Company's strong treasury. At the same time, management is seeking out additional investment and project acquisition opportunities across the globe.